If you are at all inclined to support the projects of artists on Kickstarter, I encourage you to help fund this anthology to be edited by Ellen Datlow, a woman I have greatly admired since I was a wee lass collecting books like Snow White, Blood Red. Click here to find our more and pledge to FEARFUL SYMMETRIES. 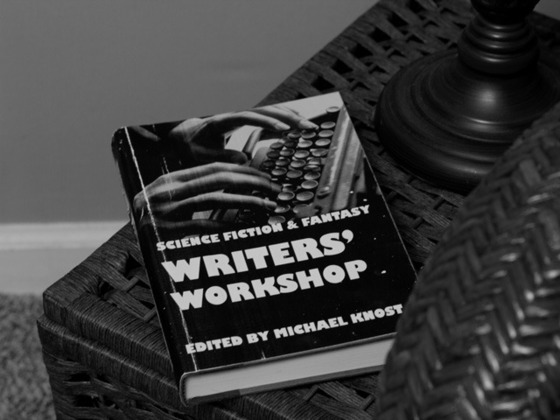 This is one of those projects I contributed to so long ago that I keep forgetting about it — The Writers Workshop of Science Fiction and Fantasy, edited by Michael Knost. Michael has set up a Kickstarter for the project — which has already reached its goal, hooray! — but I encourage you to click on over and check out some of the HILARIOUS horror spoof videos they made to promote it. There are seven levels of participation, six of which involve receiving a version of the book, ranging from the eBook to a limited hardcover edition. We invite you to look over the various levels and rewards in this campaign, the core of which serve effectively as a pre-order offer for The Writers’ Workshop of Science Fiction and Fantasy. What does the money raised in this campaign go towards? The money raised in this campaign goes towards paying pro-rates for collaborators, as well as cover art fees and other hard costs involved in producing this title. It will be issued in a limited hardcover edition, softcover, and various eBook formats. My contribution to the piece: An interview with The Machine of Writing himself, Kevin J. Anderson. Thanks in advance — I know you’ll enjoy it! I’ve always been proud of my friends, long before we were US. I knew we were all destined for greatness, not just me, like the psychics had said. We were going to be doctors and lawyers and surgeons and politicians and artists, and we were going to rule the world. Our ovens just hadn’t preheated yet. Drew Bates and I didn’t know each other very well back in middle school, but I think we went on a couple ALERT trips together, and we had a few really good friends in common. We talk a lot more now than we ever did. Thanks to Facebook, I discovered that we share the same birthday. (Something about us 1-11 babies…) I also discovered that in 2007, Drew was in a car wreck that left him a quadriplegic. Has that stopped him from making things happen? Of course not. Because we are amazing, and we always have been. Drew Bates was a dreamer, always with his head in the clouds. His friends and family described him as…Unique. Then one day, he discovered he could make a really cool robot voice by speaking into his drinking cup. With sounds bellowing in his ears, he thought, “I want to do this everyday.” He watched countless science fiction movies, and cartoons, played video games, read Popular Mechanics, Popular Science, and National Geographic, until he found a sci-fi book at a school book-fair about robots. Drew founded UniquePublications LLC in 2006 to create spec animation concepts. Not your average concepts, but…Unique. All I can add is that Drew is a fabulously talented and amazing person, and I am so glad that I’ve been able to get to know him better since we’ve graduated. I am incredibly proud of him and can’t support him enough. To find out more about Drew and his projects, visit the UniquePublicationsLLC website. For updates on Redneck Ninjas specifically, check out the Kickstarter page. You can also friend Drew on Facebook (but be quick about it — he has more friends than *I* do). To learn more about the Quad Fund (a not-for-profit fund to help those with a Spinal Cord Injury (SCI) or other disability) visit Drew’s information page here.